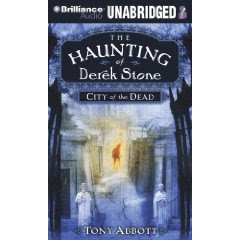 City of the Dead (The Haunting of Derek Stone, Book 1) by Tony Abbott. Scholastic 2009. Brilliance Audio, 2009. Read by Nick Podehl. Reviewed from audiobook donated for review. The Plot: Derek Stone, 14, lets you know, up front. He doesn't make stuff up. It's important for you to know that, because what he's about to tell you is hard to believe. It's about ghosts. And dead people. It all started when Derek and his family were in a horrible train wreck; his father's and brother's bodies aren't found. Weeks later, a miracle. His brother Ronny shows up at their home in New Orleans, alive! But he's acting odd. Acting, instead, like someone else. Derek finds out the hard way: ghosts are real. Except instead of haunting people, they take over their bodies. Ronny isn't the only one. The Good: It was difficult writing the plot for this book because a lot happens and it's very information-heavy, explaining back-story and world-building a place where ghosts are real. This is the first in a paperback series; so far this year, four books in this series have been published. In addition to City of the Dead, they are Bayou Dogs ; The Red House ; and The Ghost Road . More may come. It's one of those paperback series that kids eat up like popcorn; frequent new books, short (barely 100 pages), and action-packed. In a way, they remind me of those movie serials they used to have, pre-TV. Lots of action, barely time to breathe, ends on a cliff-hanger. So, here, we bounce from train crash to recovery to funerals to OMG Ronny's alive to finding out that there are ghosts, and in certain situations they can enter other people's bodies and live in that other body. So, Ronny's body, someone else's spirit. And then we find out that there are a bunch of ghosts of murderers/arsonists/criminals who have also come back and are after Ronny and Derek. Derek has a lot on his hands - trying to figure out this ghost-business, finding out whether his brother is in Ronny somehow or if its just the ghost, realizing his place in it. There are lots of hints of other mysteries: where is Derek's mother, who is supposedly somewhere in Paris? Why did she leave ten years ago? What happened to Derek when he was four? Why does Derek hear ghosts? Why do the ghosts want Derek? Abbott does a great job of pacing the action in this series; every now and then the information dumps are a bit much. Derek does research on his own, and discover things on his own, which is good; Derek, like the reader, is only just starting to understand things. But Ronny clearly knows more than he's telling, and it's frustrating that the action stops these two from sitting down and Ronny just spilling the beans on what is going on. But he cannot because BAM more action, running, bad guys! Derek is likable; and I want to find the rest of the books to see what happens next. For an adult reader, it's a bit frustrating because there are no answers. Or, rather, for each question answered, two new questions pop up. But this is the type of story that isn't told in one book, but in several. It's for the readers who want that action, even want that frustration, and want the next book ASAP. It's for readers who want serial storytelling. How does this work on audio? Excellent. I grabbed it because I wanted something short; I didn't realize it was the start of a paperback series and when it got to the end, I didn't believe it. Nick Podehl does a brilliant job with the narration, capturing Derek's voice with a slight New Orleans accent. I'm also pleased to see that books like City of the Dead are being turned into audiobooks; it's fun, escapist reading. Audience: Whether in paperback or audio, this is a great addition to a library where you have fans of Goosebumps and other horror. Derek is fourteen, but the audience is younger than that; and while there is action and creepy gross stuff and violence (the train crash, ghosts, deaths) it's not overly explicit. The publisher's age range is 9 to 12, and I agree with that. Your middle grade and middle school readers will enjoy it. Plus, the short chapters and constant action is a plus for reluctant readers. I read this a while ago and had fun with it! Thanks for blogging!